Critically-acclaimed writer Alex de Campi (NO MERCY, Grindhouse), artist Tony Parker (This Damned Band), and colorist Blond (Do Androids Dream of Electric Sheep?) 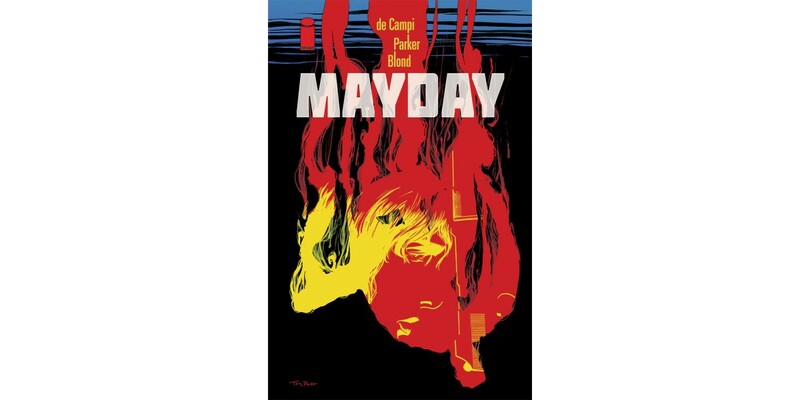 will, appropriately, release a trade paperback collection of their blood-soaked thriller MAYDAY this May. April 1971: the CIA is handed the espionage coup of the decade when a KGB general defects with a list of all Soviet intelligence assets in Asia, including spies within the US Army in Vietnam. All Jack Hudson has to do is get the defector and his microfilm from Hong Kong to California...and keep Palm Springs’ overzealous FBI office from turning everything into a freakshow. All Codename: Felix has to do is kill the defector and get the microfilm back to the USSR, by any means possible. Easy, right? Now throw in a beautiful woman, a fast car, and a whole lot of drugs—and watch it all crumble. MAYDAY TP (ISBN: 978-1-5343-0157-3, Diamond code: MAR170811) hits comic book stores Wednesday, May 24th and bookstores Tuesday, May 30th. The final order cutoff deadline for comics retailers is Monday, April 24th. MAYDAY TP is available for preorder now via Amazon, Barnes & Noble, Indiebound, and Indigo.